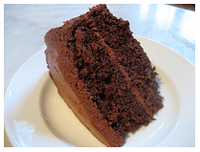 It's a snap to make this easy chocolate cake recipe! Here's my take on an easy chocolate cake recipe--easy ingredients, easy preparation, one bowl and easy clean up! It's that simple...even a kid could make this recipe. That's right...this recipe can be mastered by anyone whether you have baking experience or not. One bowl makes for easy clean up, but we haven't sacrificed good taste! Take my word for it....you'll want to add this recipe to your repertoire! "Your website looks good! I love the idea of providing easy recipes for baked goods -- so many people don't realize how easy it is to make a cake from scratch. And it tastes so much better too! 2. Preheat oven to 350° F (180° C). 3. Grease and flour 2 (9-inch) layer cake pans. 4. Sift together the flour, sugar,soda, baking powder, salt and cocoa. 5. Add shortening, eggs, vanilla, milk and water. Beat on low speed for three minutes, then pour into your prepared pans. 6. Bake in preheated oven for 30-35 minutes, until a cake tester comes out clean. 7. Cool in the pans on a rack for 15 minutes, then turn the layers out onto a cooling rack and cool completely. Chop the chocolate and place it in double boiler and melt over low heat. Stir until just melted and set aside to cool to room temperature. In a bowl, beat the butter until light yellow and fluffy (approximately 3 minutes). Add the egg yolk and vanilla and continue beating for another 3 minutes. Gradually add the powdered sugar and then beat at medium speed. Dissolve the coffee in 2 teaspoons of hot tap water. Add the chocolate and coffee to the butter mixture and mix until blended. Don't whip! Spread ASAP on the cooled cake.